Memorized poetry used to be the mainstay of education; today it is truly a lost art. These products help reintroduce this vital source of linguistic patterning to students. Learn not only quick and accurate methods of memorizing poetry but also the fundamental components of poetry. 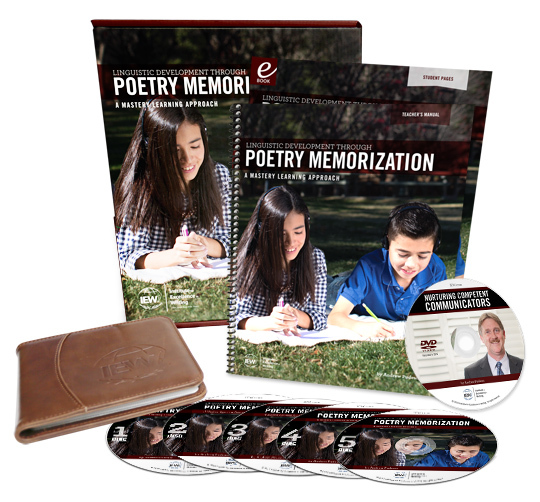 This teaching tool includes a book with ninety-six poems and speeches as well as all the poems and speeches read on CD (also comes with MP3 downloads) for ease of memorization. Instructions, memory charts, certificates, and poet biographies are included, as well as a complementary Student Book as an e-book download. You will also receive a bonus DVD of Andrew Pudewa's conference talk Nurturing Competent Communicators. This teaching tool includes a book with ninety-six poems and speeches as well as all the poems and speeches read on CD for ease of memorization. Instructions, memory charts, certificates, and poet biographies are included, as well as a complementary Student Book as an e-book download. You will also receive a bonus DVD of Andrew Pudewa's conference talk Nurturing Competent Communicators. The audio CD recordings included with the packet will facilitate learning through repetition so that students can master poems quickly and accurately. Be sure to read the introduction to this book frequently to be reminded of the importance of poetry memorization for the linguistic development of children. "Memorization is not only natural for young children, it is culturally powerful and educationally essential." This is the ideal introductory text for students and teachers discovering the art of poetry. As a "grammar," it teaches the fundamentals of poetry from scansion and rhyme to more advanced concepts like spatial poetry and synecdoche. Using the classical methodology of imitation (advocated by educators like Quintilian and Benjamin Franklin), this text makes students become active participants as they learn the craft of writing poems. It also offers practical tips and helps, including how to use a rhyming dictionary, how great writers use figures of speech effectively, and even when to break the rules of poetry. Its goal is to show students how to capably interact not just with poems, but with language in any situation. Developed and used at Logos School with great success, the thirty lessons in Grammar of Poetry contain instruction on ten powerful tropes, student activities for every chapter, riddles to solve, a glossary of terms, a list of over 150 quality poems to integrate, and real-life examples from Shakespeare to traditional tongue twisters. It is designed for a semester at the 6-9th grade level, but is perfectly appropriate for anyone with basic writing skills and the desire to learn poetry.